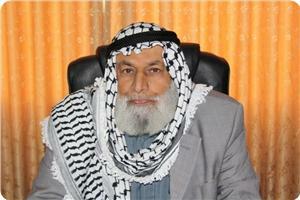 Israeli occupation forces (IOF) failed to arrest 75-year-old Palestinian MP Ahmed al-Haj Ali after raiding his home in Nablus on Wednesday morning. The MP’s daughter, Hiba, told the PIC reporter that a large IOF force stormed the building where her father lives in Nablus and ordered all inhabitants out. She said that the soldiers crammed all inhabitants in the building’s parking lot and started searching all apartments after breaking their front doors. After one hour of search they could not find the MP, she said, adding that commander of the Nablus area told her that her father should give himself in or else he would be liquidated. The IOF has been looking for MP Ali for three months without taking into consideration his old age, but could not find him despite breaking into his home for five times. Israeli Occupation Forces (IOF) carried out at dawn Wednesday a large raid and arrest campaign throughout the West Bank. 16 arrests were reported. Local sources confirmed that three Palestinians were arrested in Arqa town, west of Jenin, after Israeli military vehicles stormed the town. Two Palestinians were also arrested late Tuesday in Beit Ummar in al-Khalil after being summoned for investigation in Etzion investigation center. 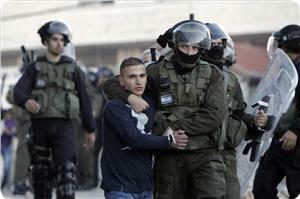 In Nablus, IOF soldiers arrested two young men while a third was detained in Tulkarem. 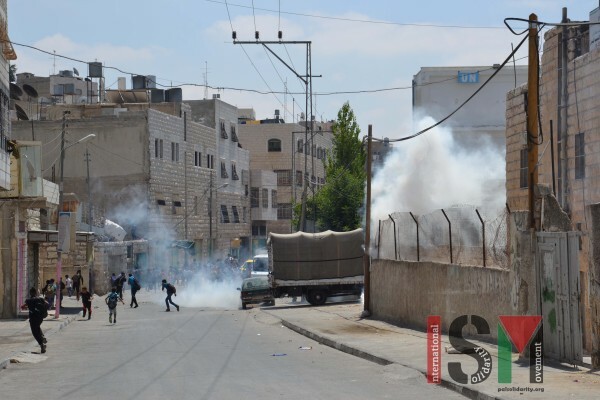 Eyewitnesses said that large Israeli forces stormed at dawn Wednesday Nablus, which led to the outbreak of violent clashes. 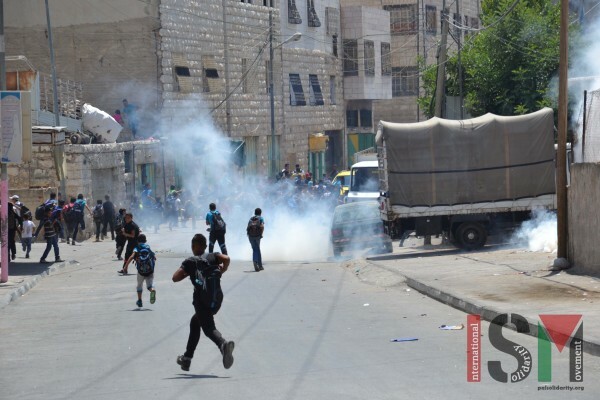 Two young men were seriously and slightly injured during the clashes. IOF soldiers had also encircled a sports institution in the area in order to arrest Mostafa Abu Riyala, who was injured while trying to escape. Heavy tear gas and sound bombs were fired during the arrest campaign, which spread panic among the residents. IOF soldiers rounded up six Palestinians in Qalqilia while trying to infiltrate into 1948 occupied lands seeking jobs, local sources said, adding that all of them were from Jenin villages and included two brothers. Israeli forces also broke into Aqraba town near Nablus while violent clashes broke out in Asker refugee camp east of the city. No arrests were carried out. In Ramallah, a 19-year-old young man was arrested at a military checkpoint near Halamish settlement built on Palestinian lands. Along the same line, Ahrar center for prisoners’ studies revealed that Israeli army troops had destroyed furniture and belongings estimated at $250,000, throughout the West Bank since the start of its military operation in mid-June. The human rights report said that the estimated losses were figured out after a field study of 150 homes was conducted to assess the damages. The report did not include money, computers and the like, which were confiscated during the break-ins and never returned. Most of the raided homes were stormed in very rude and violent way after blowing up the external doors. 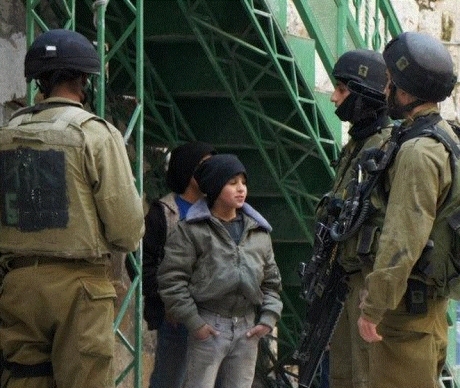 Ahrar center reported that 487 raid operations were carried out throughout the West Bank while 2,900 homes and press, educational, health, and charitable institutions were violently stormed since the kidnapping and killing of three Israeli settlers in al-Khalil on June 12. These raid campaigns came as part of the Israeli war against the infrastructure of “individuals” suspected of affiliation with Hamas, according to the report. Israeli soldiers invaded, on Wednesday at dawn, the northern West Bank city Nablus, and broke into a local sports center, a kindergarten, and a society for the disabled, shot and wounded one Palestinian, and kidnapped another. 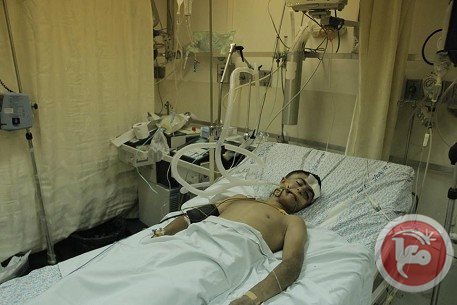 Local sources said that resident Amir Qamhiyya, age 20, was shot in the chest by a live round fired by an Israeli soldier, and was moved to the Rafidia Hospital suffering a moderate but stable injury. The incident took place following clashes which took place between the invading soldiers and local youth. Mo’awiya ad-Dardouk, head of the Sama Athletics Center, stated that the soldiers invaded the society in the al-Ma’moun Street, and kidnapped one Palestinian identified as Mustafa Abu Ryala, 20. The sports center is located in one of the floors of an apartment building in the city. Soldiers detonated the main door and violently searched the property, causing excessive damage. The soldiers also invaded a charitable society that provides services to disabled Palestinians and a kindergarten, before violently searching them and ransacking their properties. 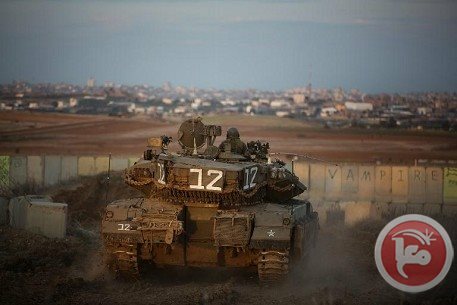 Israeli soldiers opened fire, on Wednesday morning, at a number of Palestinian fishing boats close to the shore in the Sudaniyya area, west of Gaza City, and kidnapped two. Eyewitnesses said that Israeli navy boats opened fire at random, before attacking the fishing boats, and kidnapped two fishermen identified as Mohammad Zayed and Mousa Sultan. On Monday, at dawn, soldiers also attacked a number of Palestinian fishing boats, close to the shore, in Rafah, in the southern part of the Gaza Strip. The ongoing attacks come in direct violations of the Egyptian-mediated cease-fire agreement on August 26, ending Israel’s war on Gaza that started on July 8. At least 2137 Palestinians, including 577 children, 263 women, and 102 elderly have been killed, and more than 11100, including 3374 children, 2088 women and 410 elderly, have been injured. The attacks are also a violation of every cease-fire deal mediated between Israel and the resistance in Gaza, including the Israeli offensives on Gaza in 2012 and 2008. 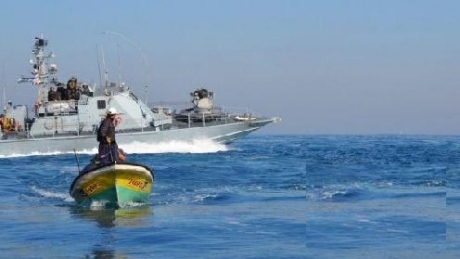 On Tuesday, Israeli warships opened fire at Palestinian fishermen in Gaza territorial waters. The August 26 agreement stipulated that Israel would immediately expand the fishing zone off Gaza's coast to six nautical miles, and would continue to expand over time. According to the deal, they would be allowed to sail out as far as nine nautical miles, a week from the cease-fire date, and as far as twelve, a month from then. Under the Oslo Agreements, the Palestinians are supposed to be allowed to fish within 20 nautical miles, but the Israeli navy kept attacking them, and their boats, even while docked at the shore, causing dozens of casualties, arrests, and destruction of shipping boats. Israeli forces have opened fire at fishermen off the coast of Rafah, in the southern Gaza Strip, in an apparent violation of the ceasefire agreement reached in Cairo last week, according to fishermen. 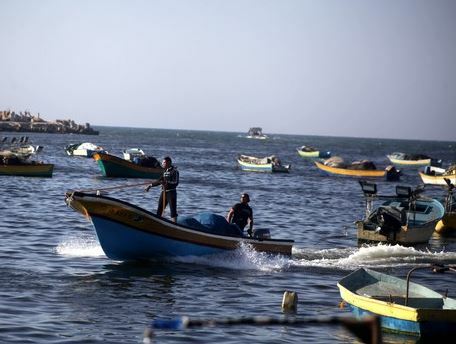 Palestinian fishermen told Ma'an News Agency that Israeli warships fired at their boats with machine guns, while they were sailing within the agreed-upon six-nautical-mile limit, near Rafah. No injuries were reported. An Israeli army spokeswoman said fishermen "deviated from the designated fishing zone," and that "warning shots" were fired into the air. Asked how far the fishermen were sailing from shore, the spokeswoman claimed she did not know the exact distance, but that it was further than six nautical miles. Prior the recent agreement, Israel maintained a limit of three nautical miles off shore for Gaza fishermen, and opened fire at any who strayed further, despite earlier agreements which had actually settled on a 20-mile limit. The restrictions crippled Gaza's fishing industry and impoverished those dependent upon it. The ceasefire agreement reached on Aug. 26 stipulated that Israel would immediately expand the fishing zone off Gaza's coast to six nautical miles, and would continue to expand over time. According to the deal, they would be allowed to sail out as far as nine nautical miles, a week from the ceasefire date, and as far as twelve, a month from then. See: "Gaza Officials: Ceasefire Terms Being Implemented"
Under the terms of the deal, Israel also reportedly agreed to ease the ongoing siege on the region. However, according to Israeli media, PM Benjamin Netanyahu does not even intend to send a delegation for negotiations in Cairo, as stipulated by the recent ceasefire agreement. A Palestinian teenager was critically wounded late Sunday after an Israeli soldier shot him in the head with a rubber-coated steel bullet, relatives said. Muhammad Abd Al-Majid Sunuqrut, 16, from Wadi al-Joz suffered a fractured skull after being shot, his father said. The teenager was speaking on his mobile phone while walking to a nearby mosque for late evening prayers when he was hit, in what his father said was an unprovoked attack. He underwent emergency surgery at Hadassah Medical Center to stop bleeding on his brain and to remove bone fragments caused by the impact of the bullet. The teen is currently unconscious in an intensive care unit and is said to be in a critical condition. Muhammad had been preparing for the new school year, his father said, adding that Israeli forces have been provoking local Wadi al-Joz residents in recent weeks by firing tear gas, rubber coated-bullets and skunk spray. Israeli forces fired warning shots near the northern Gaza Strip on Thursday, Israel's army said. An Israeli army spokeswoman said warning shots were fired in the air after a crowd of Palestinians began hurling rocks at the security fence. The crowd dispersed following the gunfire, she added. The incident took place east of Gaza City in an area adjacent to the Nahal Oz kibbutz, Israeli media reported. The Israeli security buffer zone around Gaza was meant to be reduced following Tuesday's ceasefire agreement, with farmers initially reporting that they were able to access their fields 100 meters from the border fence. Before Operation Protective Edge, Israeli forces routinely opened fire on those who entered the buffer zone, which ranged from 500-1500 meters from the border and encompassed 17 percent of Gaza's total land area. In March, a mentally disabled 57-year-old woman was shot dead by Israeli soldiers after wandering near the buffer zone east of Khan Younis.